Starting his martial arts experience with Tae Kwon Do, then Shotokan Karate and Hung Gar Jalal Merhi entered in over 150 tournaments with a great deal of success. Jalal got to know many people with influence and his career as producer, actor and filmmaker was born. He worked with martial arts legends such as Bolo Yeung, Cynthia Rothrock, Olivier Gruner, Loren Avedon and Billy Blanks. 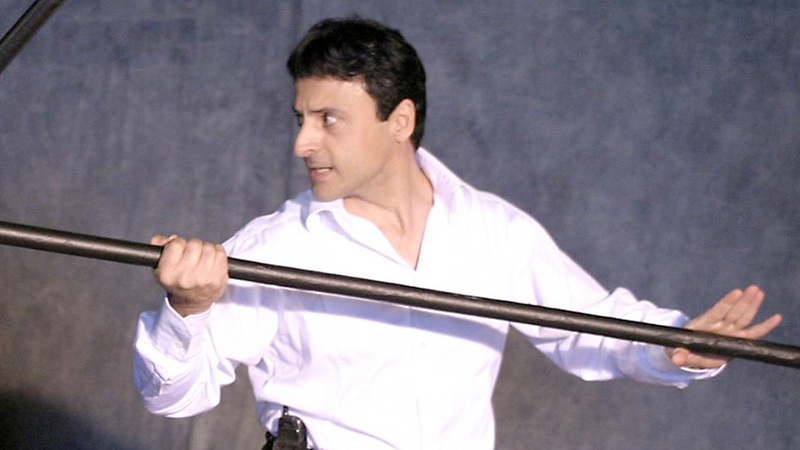 Jalal Merhi is recognized worldwide as an action film producer/director made over 20 martial arts films. Jalal Merhi is recognized worldwide as an action film producer/director after successfully delivering over 20 films worldwide and numerous short film projects. He started his film career by selling his jewellery business to start a film production company. Budomate: As far as I know you have got Lebanese background and moved to Canada. Could you tell a little bit about your life in Brazil and why did you move to Canada? Jalal: I was born in Brazil then I went as a kid to Lebanon, and after few years, I moved to Canada in order to go to school, and learn English, but I enjoyed the freedom of living alone and being self sufficient, in addition I found great Kung Fu school, so I stayed. Budomate: When did you start practicing martial arts and what style was it? Jalal: First of all by age 11, I found my grand fathers gloves and fitness books from the time he lived in Ohio USA and was an amateur boxer, so I worked on getting fit first. Then I started with Taekwondo, and after joined a club called “Benzi” in Beirut, the club was a member of JKA, and I still have my first membership card and T-shirt. As a teenager I moved to Canada and started with Choy Lay Fut and Hung Gar, then continued with Shotokan Karate because it was close to my JKA style and got 2nd Dan in that. Budomate: Have you got any titles and did you participate in any championships? Jalal: I did compete in apx 150 tournaments, placing in the top 3 in 90% of them; this is how I met Billy Blanks and most of the other Martial artists I used in my films. Budomate: Who was your idol and why did you choose martial arts as a part of your life? Jalal: Just like most people Bruce Lee. I enjoyed the fitness part of it. Budomate: Some of admirers call you Beirut’s Steven Seagal, why? Jalal: I am not sure where it came from; I had a ponytail before that. Budomate: Have you got any hobby or passion for anything? Jalal: Yes, fast cars, cooking, traveling to new places. My family helps me to work on my few acres land. Budomate: If you weren’t filmmaker who you would be? Jalal: I am a professional jewelry maker and could make a ring from a scratch, worked in that for 14 years. But I love flying too, being a pilot would have been another passion. Budomate: There are a lot of movies related to illegal gladiator-style fights, started from van Damme‘s Bloodsport, Bolo Yeung’s Shoot Fighting and Jet Li‘s Danny The Dog, but The Circuit franchise stays apart on my opinion, you have got more drama and fights closer to reality. So how did you come to idea to make this kind of movie? Jalal: As for the Circuit, Olivier and myself were trying to make something different and at the same time have a drama. Budomate: Talking about main character Dirk Longstreet, you always knew that Olivier Gruner will be playing him or you didn’t have anybody particular in your mind and there was a casting? Does Mr. Gruner’s military experience effect on his style of fighting on your opinion? Jalal: This character is based on Olivier from the beginning. And yes it does, he is a very efficient fighter. Budomate: Have you got something absolutely new in The Circuit 3? Budomate: You had got Loren Avedon and Bryan Genesse for the first part and Lorenzo Lamas for Circuit 2, now you worked with James Lew. They are all outstanding martial artists, on your opinion who is the most bad movie guy among them or their characters absolutely different? Jalal: They are all great and I am honored to work with them. Budomate: Did you try to invite other martial artists for such kind of movies; maybe martial arts divas like Cynthia Rothrock or Karen Sheppard? Jalal: No, I think other scripts might be more fitting for them, I hope we could work together again. Budomate: You worked with Cynthia on Tiger Claws, tell more about it please. Do you remember any interesting situation on the sets? Jalal: Tiger Claws is very close to my heart and it was very interesting to have the greats Bolo and Cynthia on the same set. Too many great moments, but the film was shot in 3 parts that are month apart due to financing problems with the distributors. Budomate: Now a lot of real fighters came to Hollywood, like Don Frye and Bob Sapp in Big Stan movie or Randy Couture in Expendables. Do you want to work with these guys in your movies? Jalal: I would love to work with them if we could find a fitting project. All of my stars were real fighters too. Budomate: I’m sure you have heard about the Undisputed movies and that third movie is going to be released soon, I am not counting its showing at ActionFest this April. Do you know Isaac Florentine personally and what do you expect from Undisputed 3 The Movie? Jalal: I know Isaac, he is a talented director, but never seen the movies. Some told me that they are copy of the Circuit. Budomate: Another franchise what you worked on is Tiger Claws. You have got amazing Bolo Yeung as a killer in two parts of the movie. Why did you choose him, was it related to his popularity as a main bad guy in 90’s? Jalal: Tiger Claws was created after watching our Kung fu club workout, we always used to fight full contact. The writer (J. Stephen Maunder) was one of my students. He was watching us training with strings of the sunlight seeping into the dark gym. Budomate: How do you think Bolo Yeung looks more like a bad guy from Double Impact or Bloodsport or a good guy from Shootfighting or TC2000? How onlookers want to see him on the screen? Jalal: I met Bolo in Hong Kong while shooting my first film, than we met again on the set of Double Impact. I was impressed with his personality and ability, and who could forget him after Enter the Dragon and Bloodsport. He is the best bad guy. Budomate: Is Fearless Tiger related somehow to Tiger Claws movie? You worked with Bolo Yeung there again. Jalal: No, the distributor changed the name to that, it was originally named Black Pearls. Budomate: You have got Evan Lurie, the huge guy, in your movies. I have seen him a lot as an extras or one of the bad guys in the movies. Do you remember him and what is he doing now? Jalal: He is married and living peacefully in the US, not much acting. Budomate: I know from different people that Matthias Hues is a very nice person who really easy to work with. How did you meet him and are you going to work with him again? Budomate: You played Niki Picasso in TC2000 movie and also produced this movie. Want to say this movie is one of my favorites, maybe because there are a lot of cool martial artists united together, and director T.J. Scott knew what he was doing. As far as I know it is only one full-length movie of Mr. Scott, he specializes more in TV series. Do you remember this movie and team what worked on it? Jalal: Yes, this is TJ Scott first film as a director and I hired him to direct after seeing his 2nd unit action work and was impressed with his vision. Budomate: You and Billy Blanks served as fight coordinators for this movie. Have you got different visions of coordinating? Jalal: No, we worked on different sets and different sequences. Budomate: Billy Blanks is 7-Time World Karate Champion and the founder of phenomenally popular Tae Bo fitness system. Have you ever try his Tae Bo system? Jalal: Yes, I did try it, it is great workout, original he called it Karoubics but we know each other since we were apx 20 years old. Budomate: David Bradley is another amazing martial artist who you worked with; he is more recognizable as a second American Ninja. You worked with him on Crisis and Expect To Die. He retired of movie industry since 1997 as far as I know. What can you say about your work with him and do you still in contact? Jalal: Great martial artist and one of the best actors that could fight, but I think he lost faith in Hollywood. I do not blame him. Budomate: Also you worked with Bryan Genesse and Darren Shahlavi in Sometimes a Hero movie. Where do you meet these martial artists? Jalal: Met Bryan through the writer of The Circuit, he is a great kung fu man, and met Darren through my old film distributor, Darren is a great professional. Budomate: Talking about your current business, you have got website filmonetv.com, you worked on numerous short film projects can you tell more about them? Jalal: They are mostly artistic and showing different vision. Budomate: You worked on TV series named Soccer Dreams, tell about it please? Jalal: It Aired on Fox and we are trying to get season 2, other info are on the web. We have it also as Football Dreams. Budomate: As a man with strong passion for action films and going to become a filmmaker, what you can reckon to me and other people who want to join the world of action movies? Jalal: Make something even if it is short, but show some creativity and vision. All rights for Jalal Merhi interview reserved by budomate.com and can not be used without official permission. Too bad he borrows money for projects, and rips people off. Con Artist in real life! Once he has your money you will never see it again. Comes up with many lame excuses.